The Périgord is the old name for the Dordogne region, which is made up of 4 parts. The northern part is Périgord Vert: this is where the most rain falls and the forests are beautifully green. Towards the west, lies Périgord Blanc, named after the white chalk plateaux, an unusual archaeological area. In the south-east there is Périgord Noir, home to many black truffles. And finally, in the south, there is the Périgord Pourpre, named for it’s extensive vineyards. 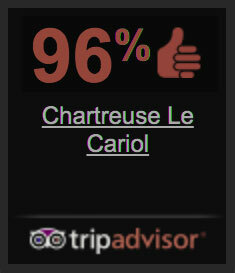 Le Cariol lies in the Périgord Pourpre, in the vicinity of the Bergerac and Monbazillac wine regions. We are surrounded by various medieval fortified towns, including Monpazier, Issigeac and Beaumont-du-Périgord. Our region is renowned for its rich cuisine, in which duck, truffle, walnuts and foie gras are central components. This area has a land climate but is also influenced by the Mediterranean Sea and the Atlantic Ocean. It is generally pleasantly mild and can become nice and hot in the summer but occasionally very cold in the winter. The air here is amongst the cleanest in Europe. In the evenings, when the weather is clear, the Milky Way and thousands of other stars are clearly visible. The Périgord is also referred to as “The Land of 1001 Castles”. In addition to the many chateaus, the region is also known for its caves where remnants of prehistoric times have been discovered.